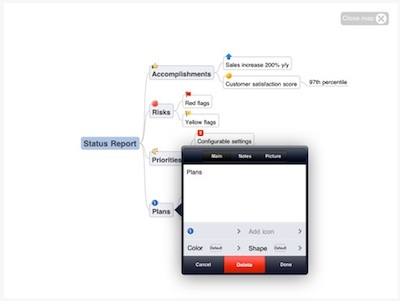 We have covered a lot of brainstorming tools you can find on our iPads. From simple to extensive features, easy to hard to learn to use and pricing all over the place. Mindjet is one of our more expensive options we have covered (not ‘expensive’ at $8.99, but more than the average $2 options). We have never minded having paid for Mindjet on our iPads since it is packed full of features that are right where they are easy to use. Now, they have cut the ‘expensive’ part by offering the Mindjet for iPad and Mindjet for iPhone (not universal)… making it available for FREE! Not to confuse the information here on the iPad app, if you visit the Mindjet Web site, you will notice they just bought the company CoHuman and will be launching a Cloud service on September 22nd. 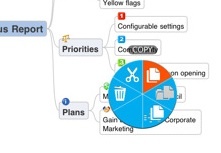 Meanwhile, we enjoy the ability to move the mindmaps via PDF email or through DropBox. All of the features are still available through the app as before it went free. 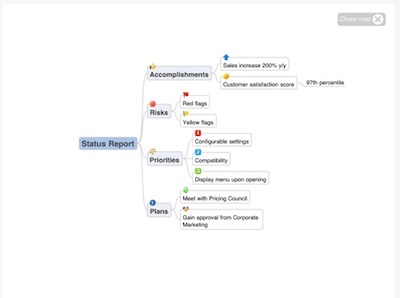 You can quickly create your mind maps or brainstorming notes, adding customization to each item with colors and even links. If you have not used the Mindjet for iPad app yet, you may find the cut/copy/paste method a bit different. It takes a second to remember that the app uses different user actions than other apps but we actually find it works quite well without the need of drop downs or extra screen taps. Quick finger actions also include drag and drop moving and you just swipe your finger on the screen to create a new topic.